Oils that contain higher amounts of monounsaturated fats, such as canola and peanut oil, tend to be among the healthier options since they help lower your low-density lipoprotein, or bad cholesterol, while increasing your high-density lipoprotein, or good cholesterol. Understanding the composition, smoke point and flavors of these oils can help you determine which is the best to use in any given situation. Canola oil is one of the oils highest in monounsaturated fat, with 62 percent, along with 7 percent saturated fat and 31 percent polyunsaturated fat. A small amount of the polyunsaturated fat consists of essential omega-3 fats, according to Cleveland Clinic. 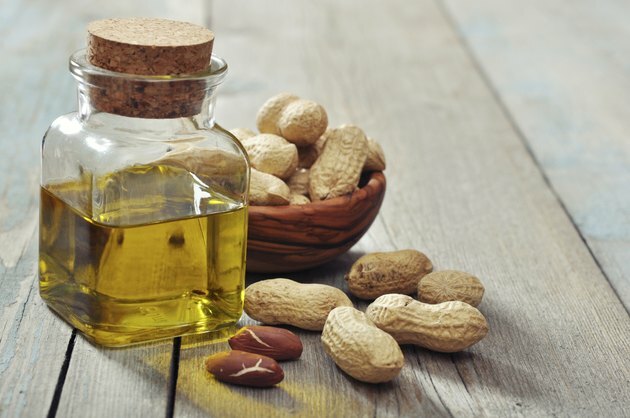 Peanut oil is higher in saturated fat, with 18 percent, making it slightly less healthy than canola oil, but it still contains 48 percent monounsaturated fat and 34 percent polyunsaturated fat. Oils shouldn't be used at temperatures higher than their smoke point, since this produces dangerous fumes and substances called free radicals that can damage your cells. If you want to cook using a method requiring high heat, such as frying, peanut oil is a better choice than canola oil since it has a higher smoke point. While canola oil has a smoke point of 400 degrees Fahrenheit, peanut oil can be safely used at temperatures of up to 450 degrees Fahrenheit. Peanut oil is a good option for deep frying, dipping sauces, stir-frying, oven cooking, salad dressings and general cooking. It is particularly good in Asian dishes since it can have a subtle peanut flavor. Canola oil has a light flavor and can be used to replace butter or margarine in cooking or baking. Use it to oil pans or your grill, stir-fry or saute, make salad dressings or cook in the oven. Peanut oil isn't safe for people with peanut allergies, so avoid using it if you are bringing food to share with other people and aren't sure whether they have any food allergies. You shouldn't use canola oil if you are trying to avoid foods containing genetically modified ingredients, or GMOs, since the rapeseed plants used to make canola oil have been genetically modified to remove a harmful compound called erucic acid.